Kids' hi-top Converse from the ‘Chuck Taylor All Star’ range. Showcasing black leather uppers, the Chuck II trainers feature classic details, including: lace up fastening with signature metal eyelets, a supportive midsole and tonal logo to the inside. Finished with branded heel counter. Upper: Leather. Sole: Rubber. 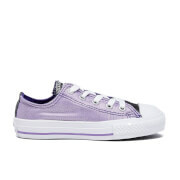 Children’s Chuck Taylor All Star II trainers from Converse. Crafted with a red Tencel canvas upper, the high top sneakers comprise a lace up fastening with tonal eyelets and flat, red laces. The trainers are placed upon a textured rubber sole and feature Converse’s signature rubber toe cap and contrasting white midsole. Complete with All Star heel branding and the iconic Converse license plate to the rear. Upper: Canvas. Sole: Rubber. 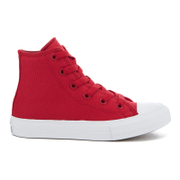 Kids' hi-top Converse from the ‘Chuck Taylor All Star’ collection. Showcasing canvas uppers, the trainers feature classic details, including a lace up fastening, metal eyelets to the inside foot and a circle patch logo. Finished with branded heel counter and vulcanised rubber sole. Upper: Canvas. Sole: Rubber. 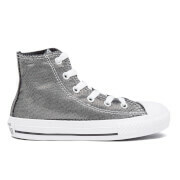 Kids' low-top Converse from the ‘Chuck Taylor All Star’ collection. Showcasing metallic canvas uppers, the trainers feature classic details, including a lace up fastening, metal eyelets to the inside foot and logo to the tongue. Finished with branded heel counter and vulcanised rubber sole. Upper: Canvas. Sole: Rubber. 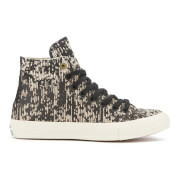 Men’s printed Converse ‘All Star II’ hi-top trainers. Crafted with a water-repellent, translucent upper, the Chuck Taylor sneakers feature a lace-up fastening with black eyelets and a rounded toe. The shoes arrive with both black and cream shoe laces. Comprising a micro-suede lining and a Nike Lunarlon insole, the trainers offer optimum comfort and cushioning. Placed upon a textured rubber sole, the sneakers are complete with ‘All Star’ heel branding and the iconic Converse licence plate to the heel. Upper: Translucent Rubber. Lining: Micro-Suede. Sole: Rubber.